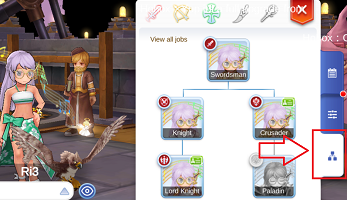 (T2) 2nd trans job Example: Lord Knight, High Priest, Sniper and etc. Click on your character icon on the top left of your game screen. Select 3rd tab to access multi-job feature. Changing to a job that have the same 1st job as your current job will cost only 500,000 Zeny. 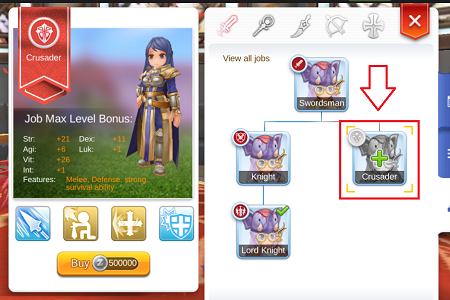 Your current job is Lord Knight, changing to Crusader will only cost 500,000 Zeny. And you can directly job change to Crusader, just head to Adventurer Hall at Prontera and complete Crusader job change quest. Base level will be the same as your Lord Knight base level. You will start at Crusader job level 1. Swordsman skill for Crusader path will be reset! If you are changing to a job that is different job branch/ different 1st job from your current job. 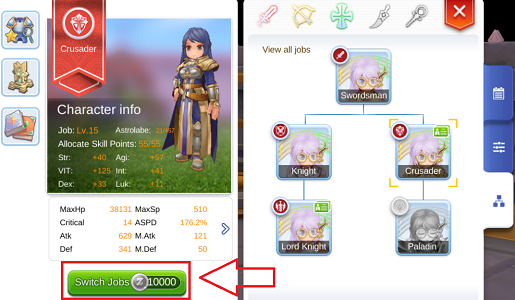 You need to pay 88 B Cat Coin for each 2nd job. 2nd Job Example: Assassin, Rogue, Priest, Monk, Hunter, Wizard and etc. You can buy B Cat Coin at Recharge. Base level will remained the same as your 1st character. 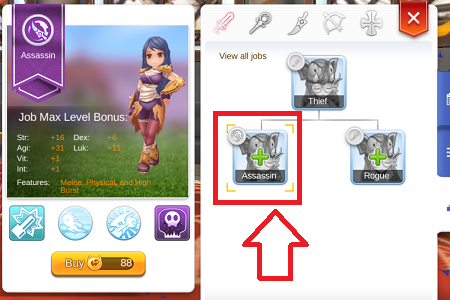 You will start at 1st job (Thief), you will need to reach job level 40 to change to 2nd job (Assassin/ Rogue). Reach job level 40 on (Assassin/ Rogue) to change job to 2nd trans (Assassin Cross/ Shinto), no additional zeny or B Cat Coin required, just complete the 2nd trans job change quest. After you have unlock the job using Zeny or B Cat Coin. You need to give 10,000 Zeny each time to change to any job that you currently have/ unlocked. You will still need to give 10,000 Zeny even though you are changing back to your original job. Character need to be in town or guild hall to job change. After you have completed the job change quest on the first time. You can directly change to that job at any time. Just make sure you are at town or guild hall. 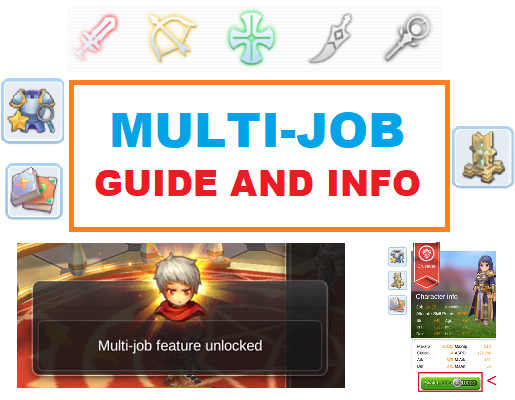 Equipment info, Aesir Monument rune, and skill info for each job can be check at the left side of the multi-job interface. These info will be save when you make changes. Base level will remained the same as your 1st character. Changing to different job on the first time, your character stats will be reset, job level will be 1. Changing to different job on the second time and so on, your character stats, job level, rune, equipment, skill will follow the changes that you have made previously on that particular job.